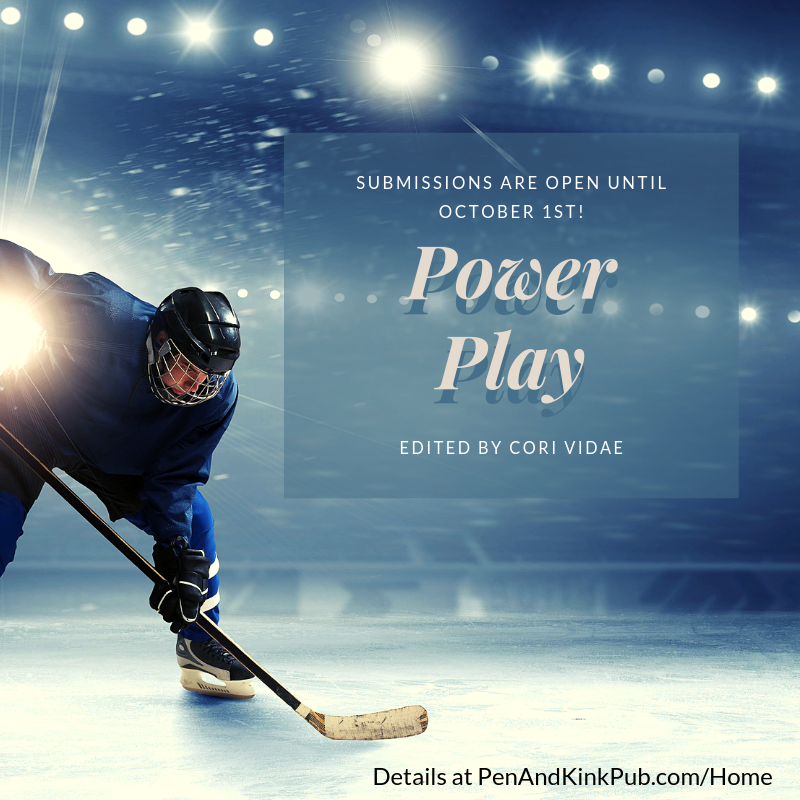 Power Play is all about the action and competition of hockey combined with the drama and emotion of romance. I’m looking for consensual power exchange romance stories that revolve around the rink. Stories like the superstar who sobers up one day to find himself stuck coaching a peewee team and falling for the dominating mother of one of his players. The trainer with creative uses for sports bandages who is looking for her perfect match. The coaches of two rival teams who discover the spark of their competition continues even outside the arena. The goalie who loves being tied to her net and finds her no-strings arrangement with the opposing team’s forward growing into something more… I want all these and more. You needn’t be a hockey expert to write for this anthology but do keep in mind that women play hockey too, ice is cold and skate blades are sharp. Open to stories at every heat level, and any sort of pairing (or more-ing) that you can imagine. Stories must have a real conflict and tension with a HEA or HFN ending. All hockey teams and players must be fictional – please don’t use any real teams or players in your stories. • Minimum word count 2,500. No maximum. • Reprints accepted but not preferred. When submitting a reprint include information about its original publication in your submission email. • Some sort of consensual kink is required. Preferably one involving a power differential. Failure to use the correct subject line may result in your story being misfiled. Confirmation of receipt will not be automated and so may take up to three days. Cori Vidae is an editor, anthologist and the founder of Pen and Kink Publishing. She works as an Assistant Editor at World Weaver Press and also occasionally finds time to write things.